I am always amazed at how dinner came together every night before 10 minutes in a store would yield everything you needed to make a complete meal. To many it seems almost unthinkable to not have a store nearby, but it has only been about 100 years since a majority of us made almost all of our foods from basic staples and did not make weekly pilgrimages to our local grocery store to pick up “a few things”. While I understand that the “everything from scratch” lifestyle is not realistic for many of us now, I have my moments where I like to get in the kitchen and really DIY good food. This generally happens during the weekend when all my people are around to pitch in and we have nowhere to go and nothing to do. My absolute favorite family style DIY is pasta, which is at it’s most basic flour and water. The process is long, can require special equipment and is not practical for a busy night dinner, but it is an experience that is worth every minute to have, not to mention the taste of the finished product! Watching something as simple as flour and water go from a mess in a bowl to a thin noodle boiled to perfection and topped with amazing fixings is magic. This is magic I love to perform in my house when I can and I hope you will give it a try and see how good food can be with a little effort. Top with desired sauces, vegetables, or proteins and enjoy! This recipe is for a basic dough, so feel free to shape and cut this how you see fit. Whip up thick fettuccine, skinny angel hair, large lasagna sheets or whatever other shape you desire your pasta to be! This is one of a very few recipes where I recommend and almost urge you to have the kitchen gadget to make this. But if you are unsure if investing in a pasta machine and drying rack are really how you want to spend your cash, it’s still very much doable without it. After all, I’m guessing most kitchens of the past turned out amazing pasta without the help of a dough roller:) In step 10, use a well floured work surface and a rolling pin to roll the dough to the desired thickness. 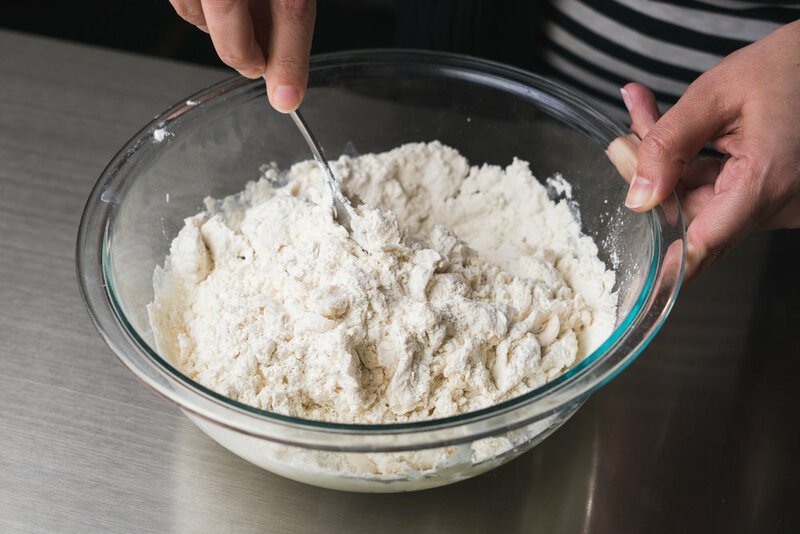 Rotate the dough so the bottom becomes the top to ensure your dough is not sticking to the work surface or rolling pin, and add a bit of flour as needed. Once you have your dough rolled out, use a knife or a pizza cutter to cut the dough into thin strips that look like spaghetti. Then dry the pasta on large cookie sheets covered with parchment paper and a light dusting of flour and proceed per the instructions above. The 2-3 minute cook time is important to note, as most boxed and dried pasta from the stores takes between 8-14 minutes to cook. My rule of thumb is to just stay with the pasta for the whole cook time because fresh made pasta tends to stick together a bit more and you will need to be there there to mix and pull the pieces apart. Fresh pasta has a shorter shelf life than boxed so I would aim to use this pasta up within 3-4 days. I store mine in large zip-top bags in the refrigerator as I have tried to store it in the pantry in the past with some pretty gross results. So keep this one cold and get it all eaten up. Which I would think would not be a problem at all!